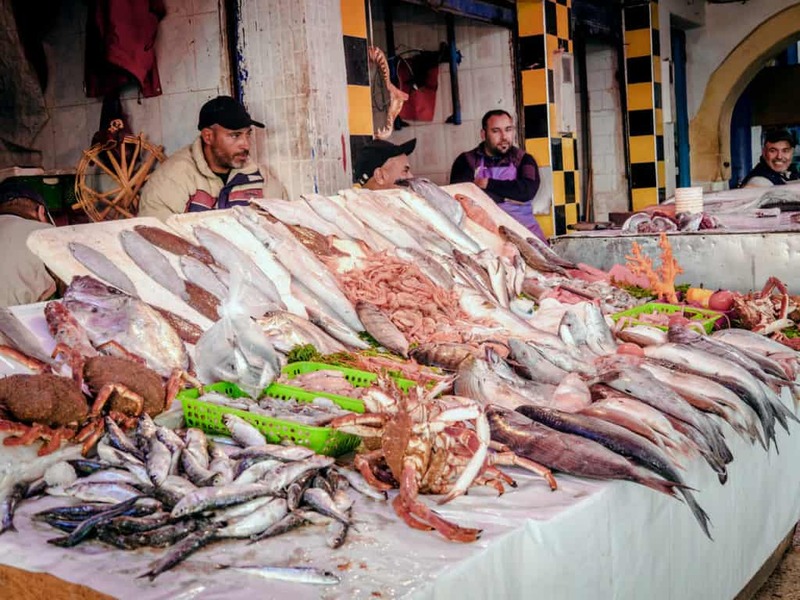 This article includes everything you need to see and do while in Essaouira, how to get there, how to get around in the city, where to eat and where to stay. Essaouira has a certain charm and it is really hard to pinpoint what exactly in this city attracts me the most. Maybe it’s the young crowd of surfers and backpackers that gravitate there throughout the year, the city’s peculiar Portuguese architecture or the small streets filled with the beautiful handicraft of local artisans. One thing is for sure, this city has won our hearts from the moment we walked its streets. It’s a trendy city with a vibrant and fun atmosphere. 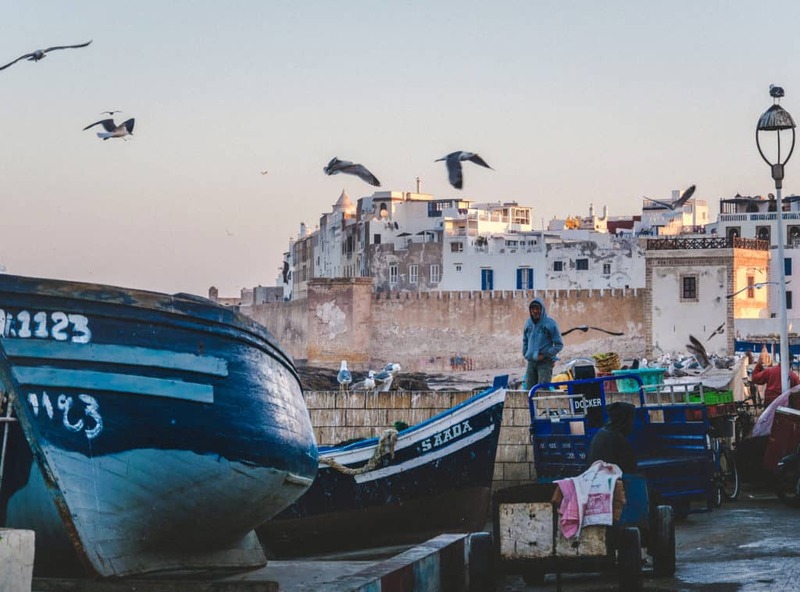 Essaouira has its own fortified old Medina, amazing cuisine and a fun and hip energy that is very distinct from other Moroccan cities. 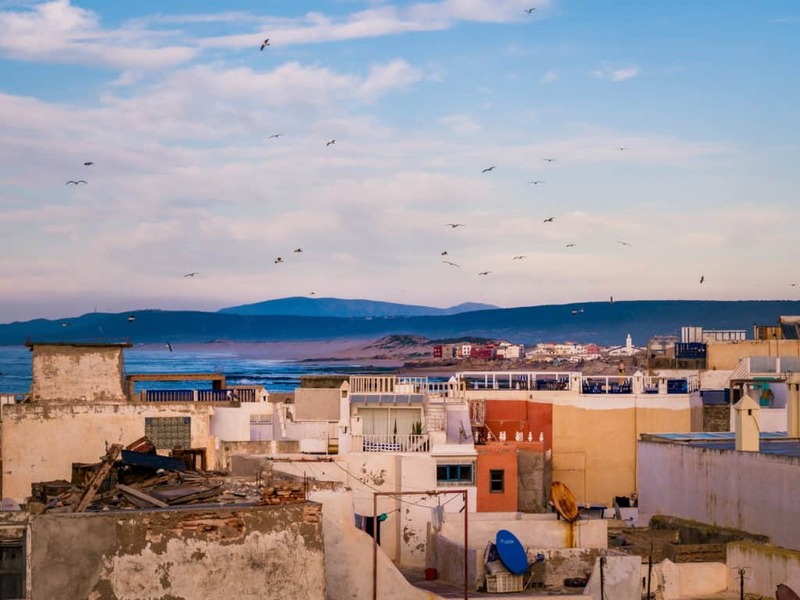 The city is located very close to Marrakesh and also easily accessible from nearby coastal cities such as Casablanca and Agadir. In this guide, I will cover everything this city has to offer in terms of what to do, where to stay and where to eat while you are there. 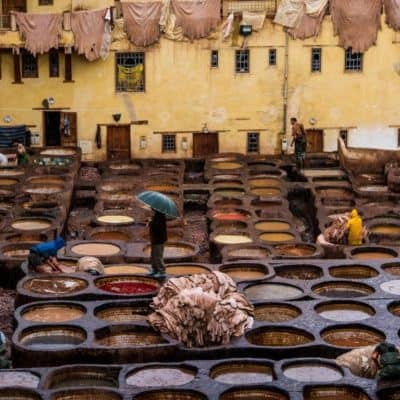 Going on a trip to Morocco soon? 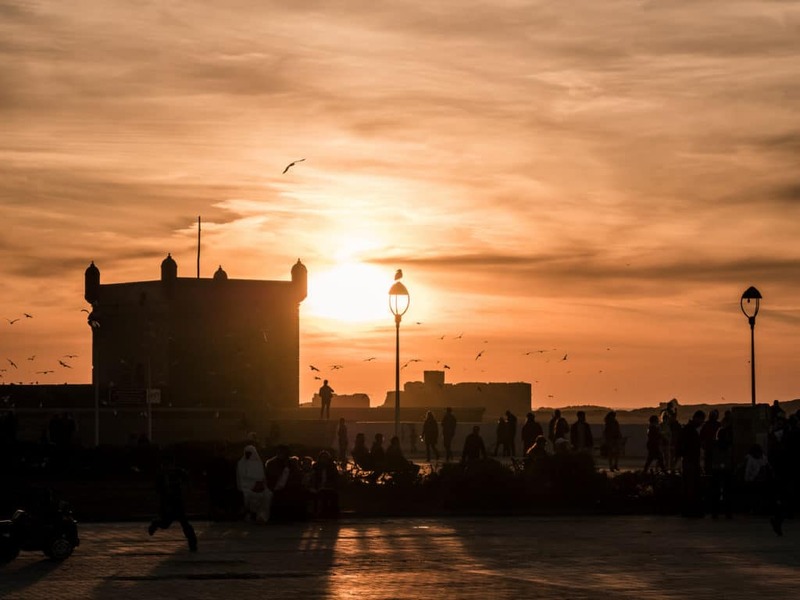 Essaouira is a city buzzing with life and regardless of the time of the year or whether you visit Essaouira with kids, with friends or by yourself, there will always be something to do. 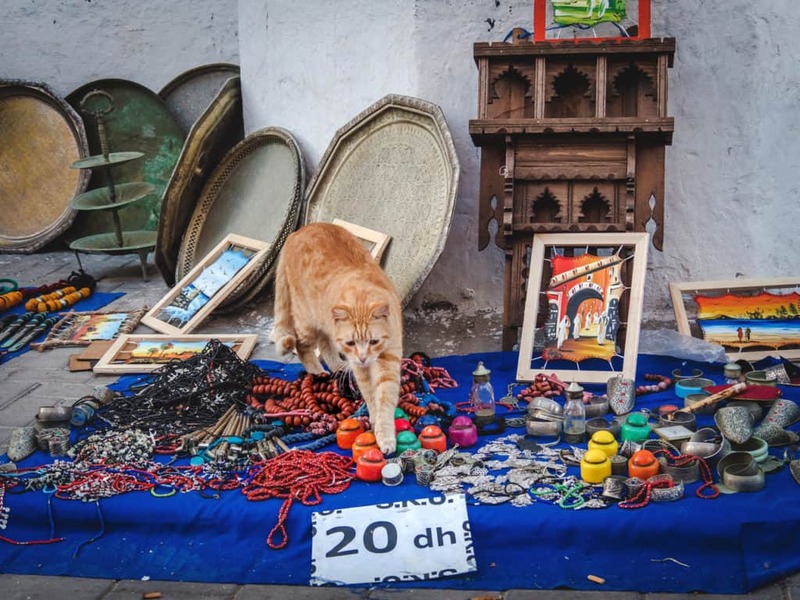 Here is a list of all the fun things you can do in Essaouira to really get the feel of the place and enjoy the city to the fullest. 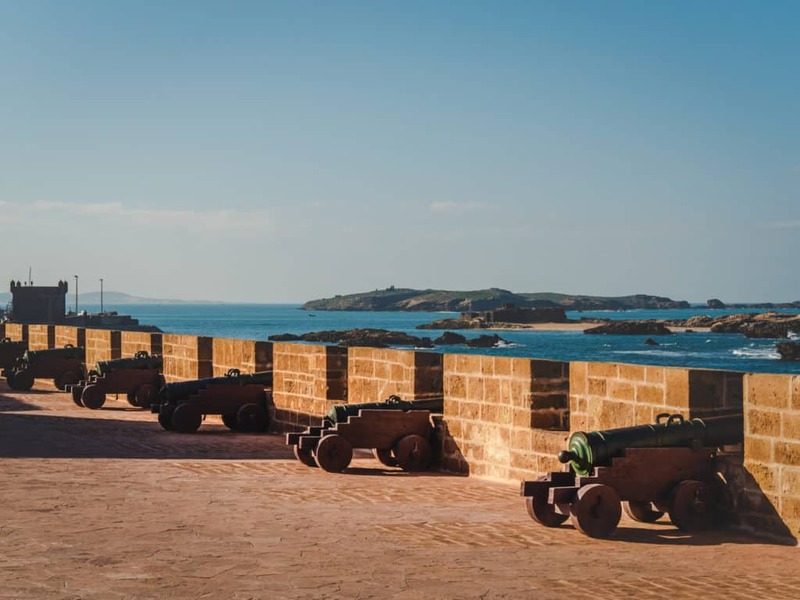 The fortified ramparts of the old Medina in Essaouira were used as a set in the popular series Game of Thrones and when you walk there, you’ll totally understand why. 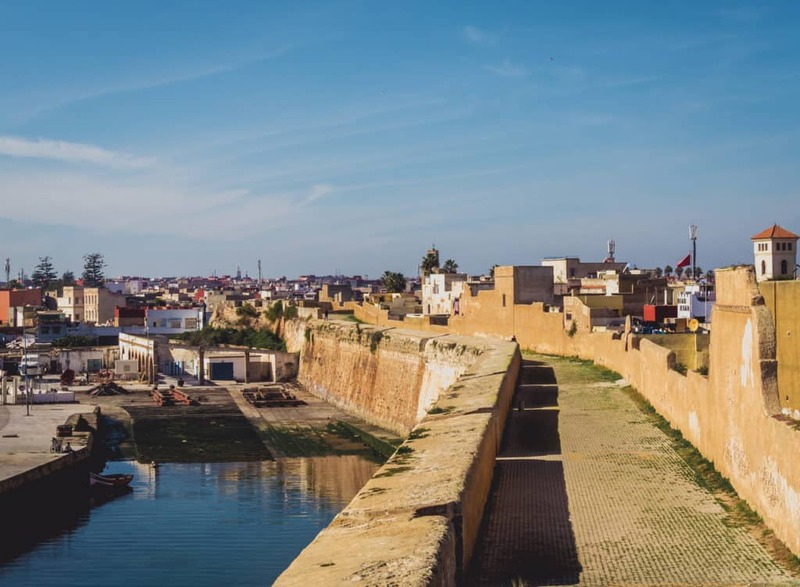 The ramparts of Essaouira are really beautiful and they give the city a medieval ambiance. 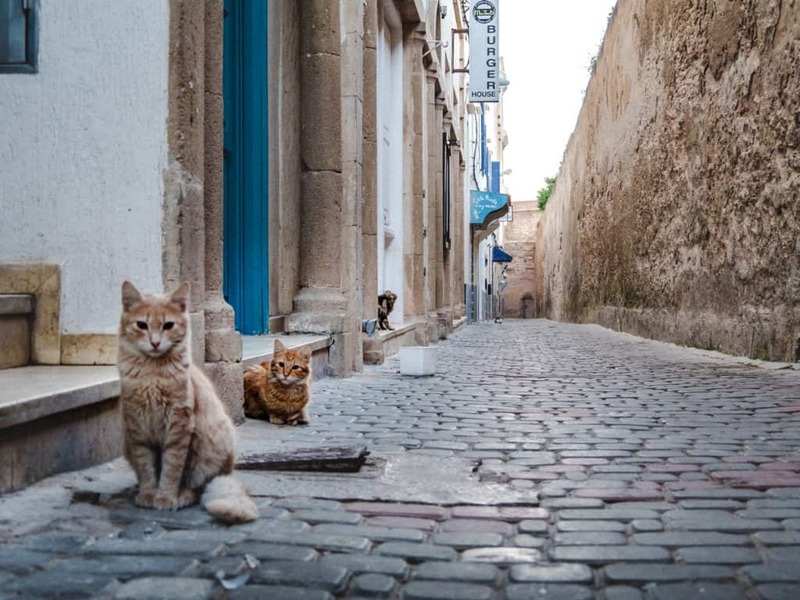 They were built in the 1760s to upgrade this small fishermen town into a royal port and commercial center. The fortifications served in defending the city from sea invaders and are still standing today. You can even sit on an ancient Portuguese canon and admire the view over the Atlantic Ocean. This port is a photographer’s paradise. 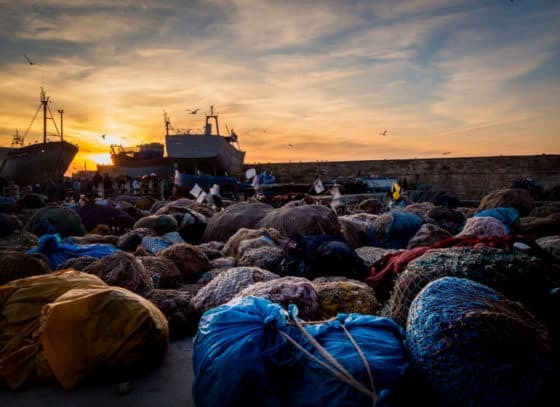 While we visited Essaouira, Cynthia just loved going there on a daily basis to get pictures of the fishermen returning from the sea in the evening. 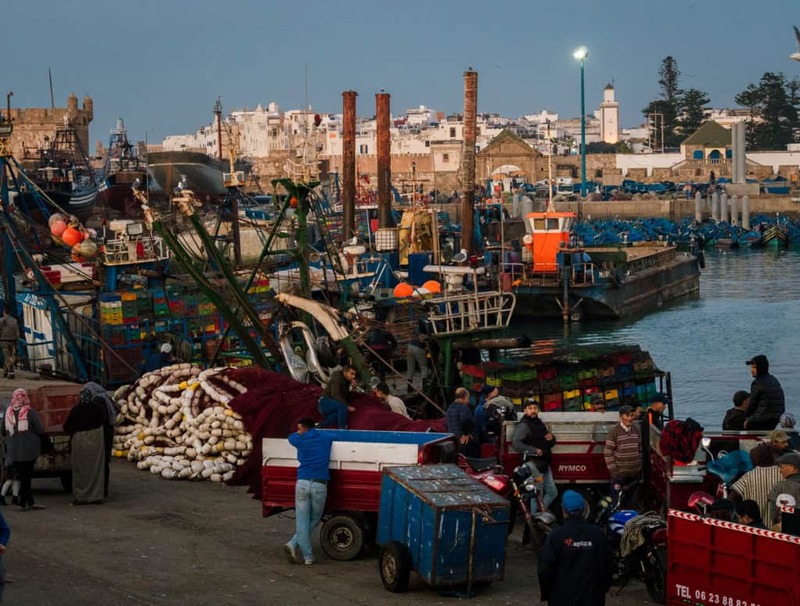 Essaouira is a fishing town and was the country’s main fishing port during the 1900s. 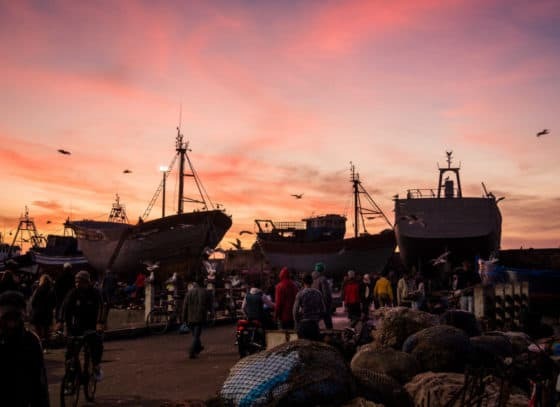 The port hasn’t lost its authenticity and is the perfect place to see the fishermen unload their catch of the day and sell it to the locals. 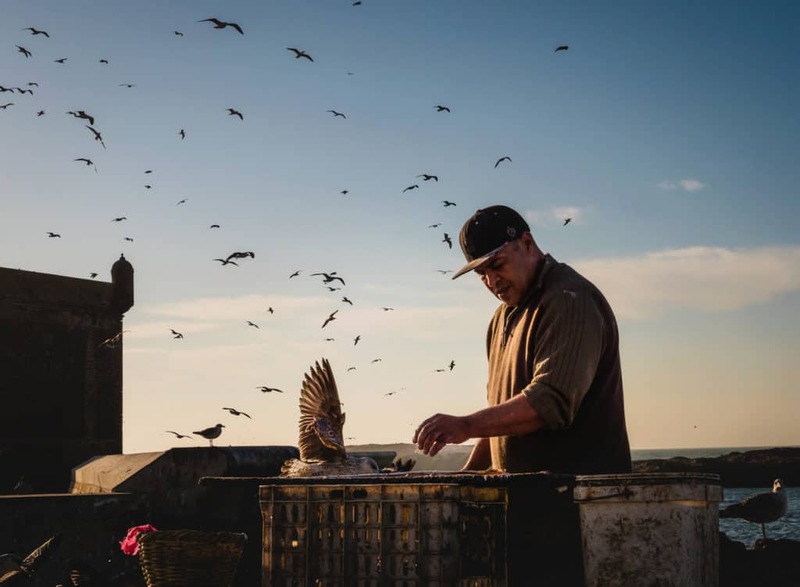 If you’re a foodie you can buy fresh fish and get it grilled directly on site. Apart from the delicious fish that you can enjoy there, the port is also a great place to admire the sunset. 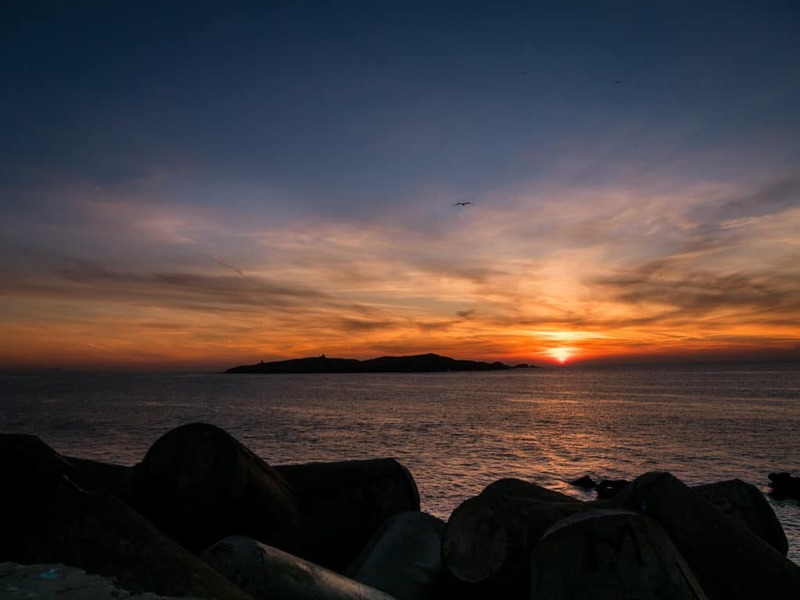 Don’t miss the chance to climb on top of the jetty for the best view of the sun disappearing behind the island of Mogador. There is a small entrance fee to go inside this fortress tower but it’s the best place to have views of the whole city. You will be able to see the port and the old town from one side and the ocean from the other. It’s best to go there on a weekday as it gets really busy during weekends. The rocks and cliffs that surround the old part of Essaouira are spectacular and you can walk near them at low tide. It’s particularly beautiful to walk there during sunset! To get there you will have to come out of the old city on the square Moulay Hassan and go in direction of the port. When you reach the end of the square you will be able to access the beginning of this rocky path on your right. The rocks continue to the right for about 1 km and they will offer you great views on the outer walls of the city. This Iconic history museum is definitely worth a visit. It is located in a 19th-century mansion right in the center of the old city and was named after the founder of the city himself. It displays beautiful historical artifacts from the city such as ancient pottery, jewelry, musical instruments, woodcraft, and weaving. The museum also contains a lot of interesting information on the Berber tribes that inhabited the region. 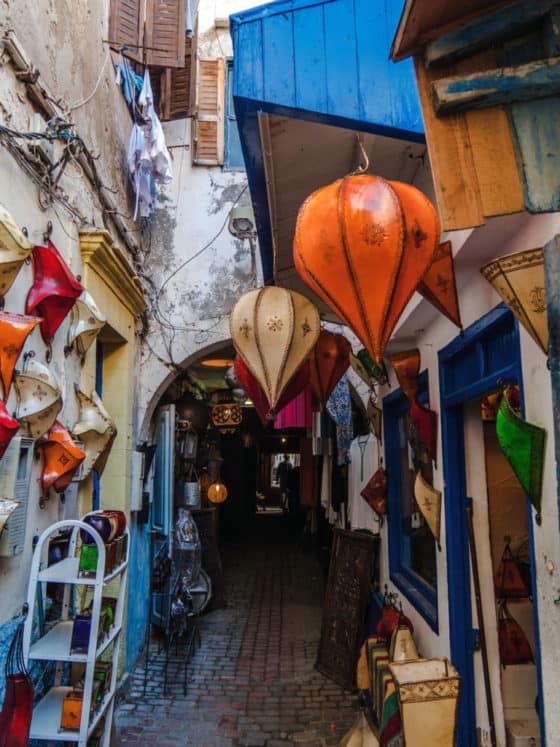 To visit this museum you’ll have to reach Rue Laâlouj, a central street of the city of Essaouira (see map above ‘Things to do in Essaouira’). 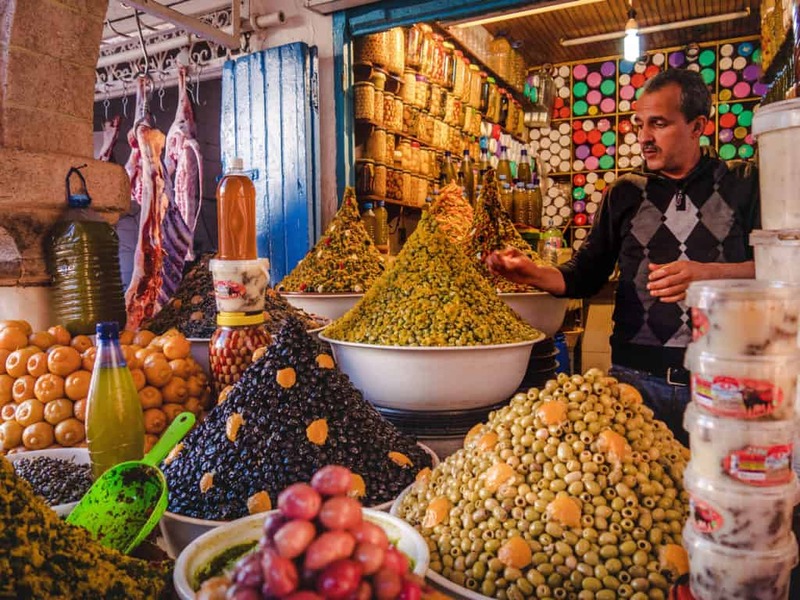 Visiting a traditional souk in Morocco is an experience that you should absolutely try. They often look like small labyrinths of stalls and shops and will overwhelm you with their smells and colors. 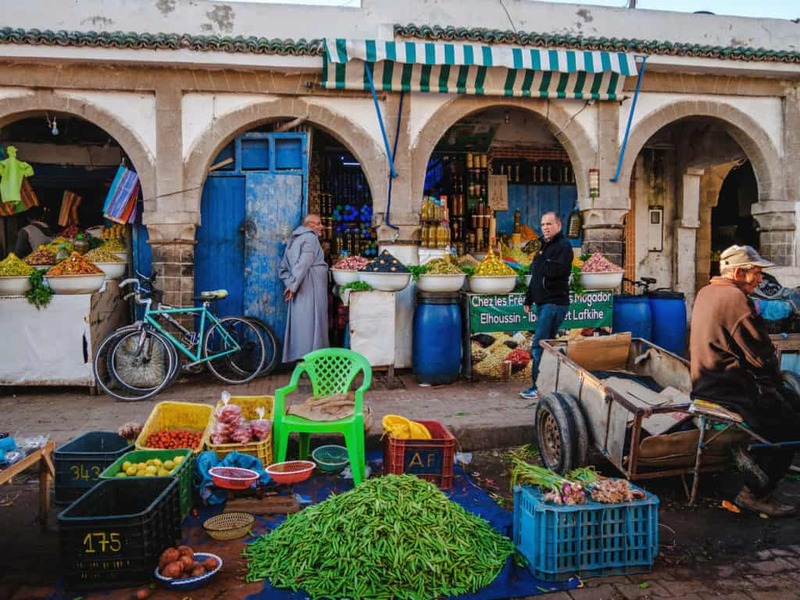 Visiting these open-air markets is the best cultural experience you could have in Morocco. 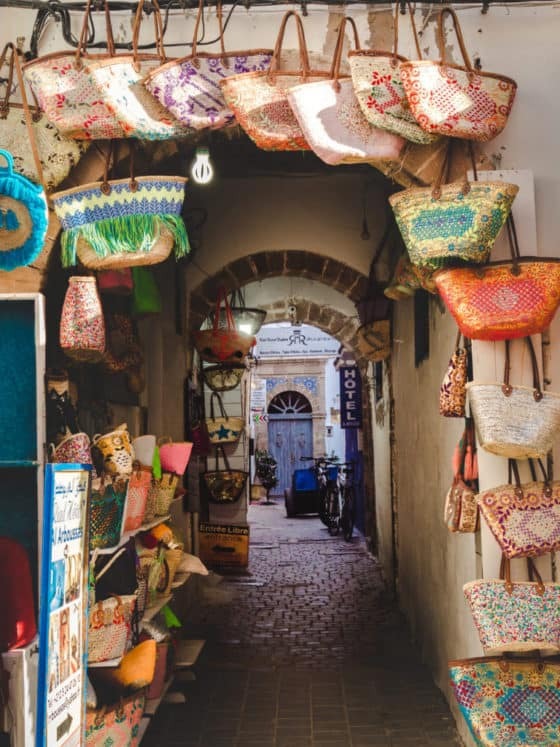 Although there is a souk held almost every day in the market area of Essaouira, the one on Sunday held just outside of Bab Doukala is particularly special. This one is a flea market where you can buy second-hand clothes, books, jewelry, home equipment, and furniture. To get there you’ll have to get out of the old city from Bab Doukala. You should continue straight along the horse carriages and pass the gas station and then you will see a street full of stalls and vendors. The beach in Essaouira is very big and there are tons of different ways to enjoy it. You can spend the afternoon swimming and relaxing while enjoying Moroccan teas at the different cafes facing the sea. If you would like something a bit more adventurous, you can also go for a horse ride along the miles of sandy coastline. 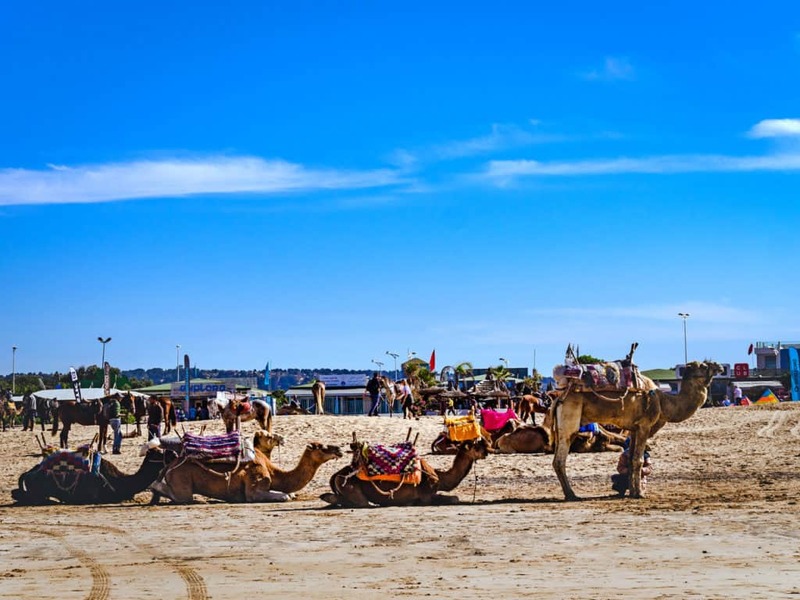 There are plenty of horses and camels on the beach available for rides for a modest price. You could also go to the horse ranch in Diabat, a small village just 3 km outside of Essaouira on the coast. They offer different horseback trips on the beach and on the surrounding sand dunes for a very good price throughout the whole year. Walk to the far end of the beach passed the camels and horses and a rock that sticks out of the sea. There you will see a river that flows into the ocean. If you follow this river to your left across the sand dunes you’ll come across a path that will take you the famed ”Jimmy Hendrix sand castle”. This ”sand castle” is actually a palace called ”Dar Sultan”. It was built outside the city near the coast and furnished in a typical European style. It is said that Jimmy Hendrix once stayed there for a whole day to drink and smoke while writing his famous song ”Castle Made Of Sand”. I was caught off guard by the sheer amount of hand made crafts I found in Essaouira. As someone who grew up without electricity and sometimes built my own toys as a child, Essaouira felt like paradise! 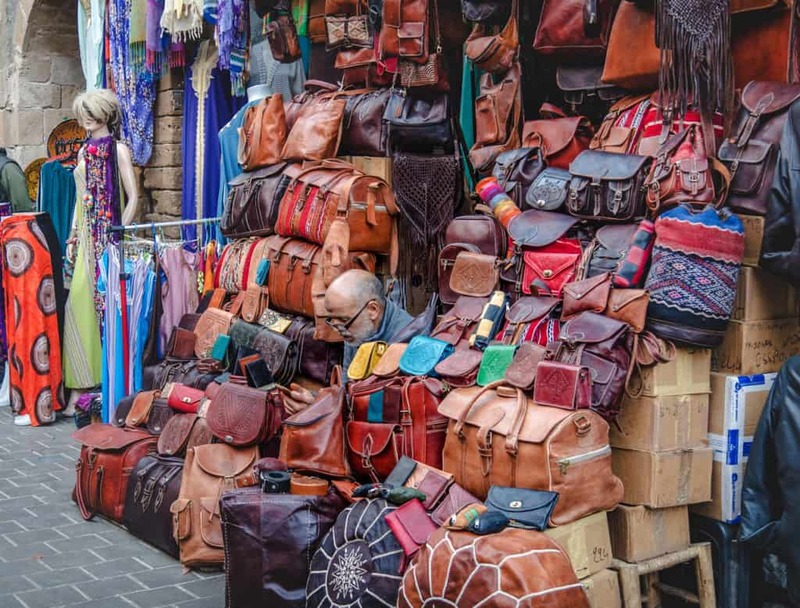 In the souks of the city, it’s possible to find handmade pottery and ceramics, leather products such as bags and shoes, hand weaved carpets, musical instruments, lamps and many more beautifully made crafts. No trip to this city would be complete without buying at least a few gifts and souvenirs for your loved ones. 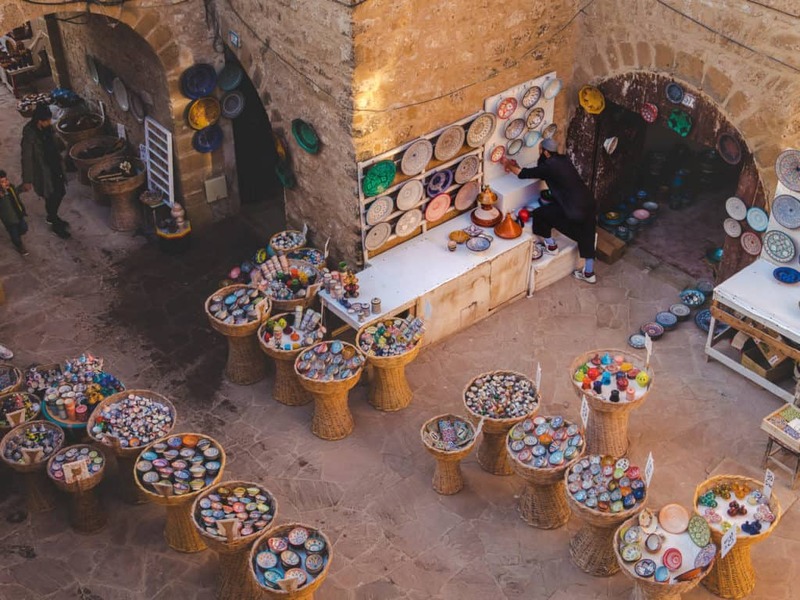 From handmade Argan soap to traditional pastries, you can be sure you’ll find something for everyone in Essaouira. This vibrant coastal city is full of cute and hip little cafes. I really enjoyed just sitting on the terrace of one during a busy afternoon and watch the hustle and bustle of the streets of the old medina. Visiting a Hammam is the quintessential Moroccan experience. In Essaouira, just like in most major Moroccan cities, you will have two options when it comes to visiting Hammams. You can either go to the popular local hammam where the majority of the locals go to or you could visit a spa type hammam. I would personally recommend the first type over the latter. Popular cheap local hammams are a great part of the Moroccan culture. 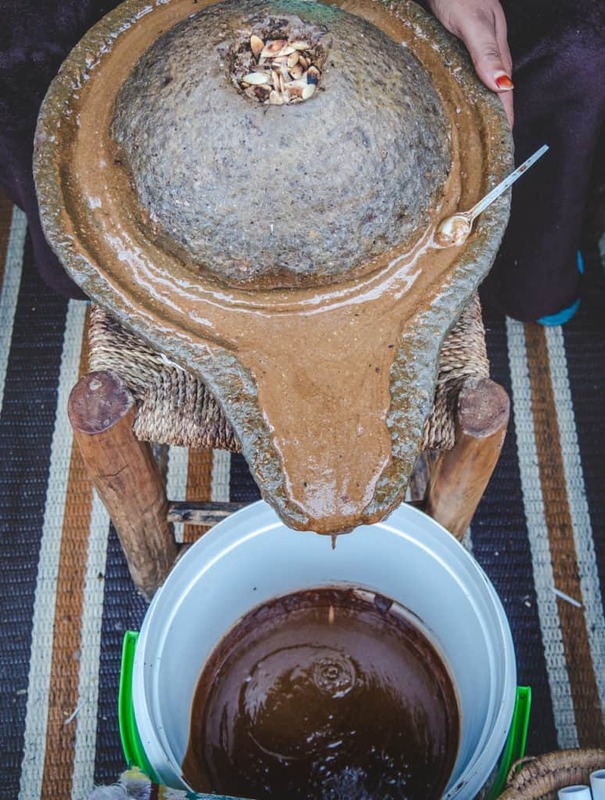 It wouldn’t be appropriate to take photos in the Hammam… So instead, here’s a picture of how the Argan nut is processed into oil and soap. Covering the hands with Henna tattoos is a tradition that is often associated with weddings and other celebration rituals. The tradition of using Henna decoratively on the body in Morocco can be traced back to when the early nomadic Berber tribes traveled around the country. Henna was used after any big event, whether it was to celebrate victory in battle, weddings or births. 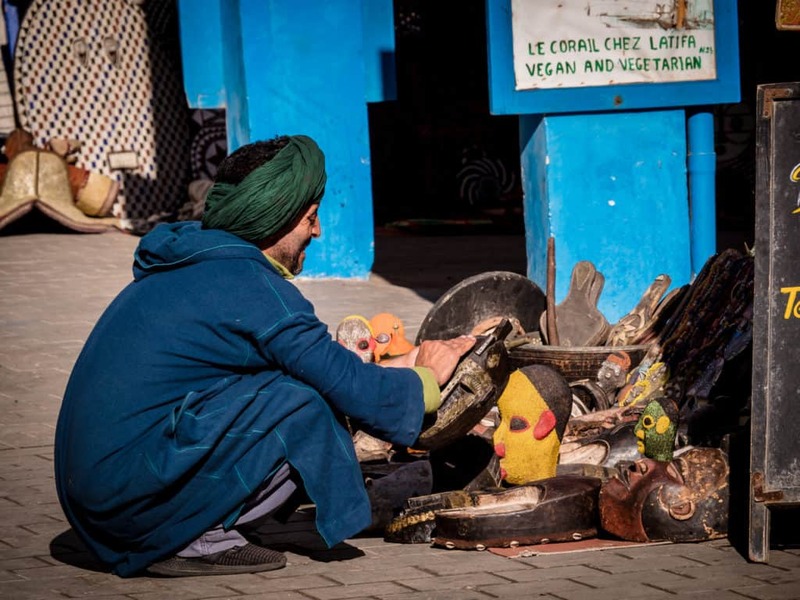 You can now be part of that tradition in Essaouira as well! Local ladies will paint your hands or feet with Henna for a modest fee in almost any main street of the old Medina in Essaouira. 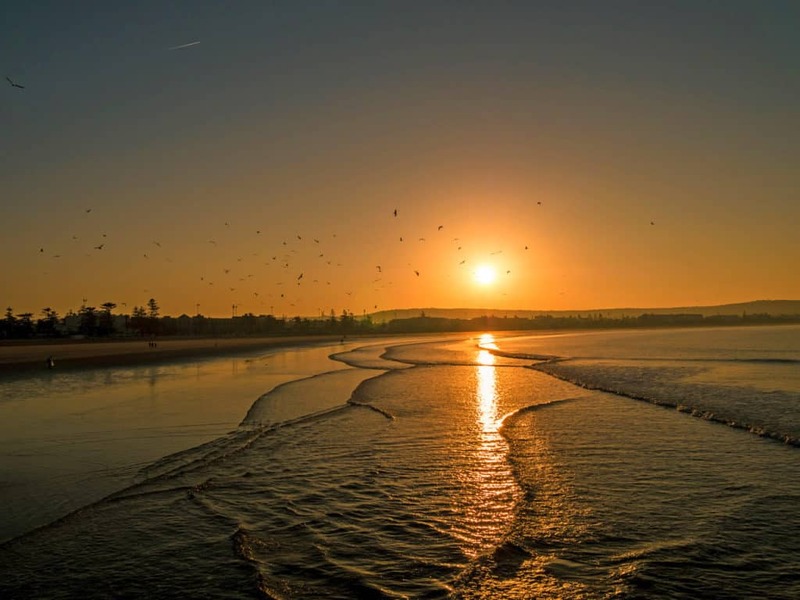 Essaouira is a windy coastal city and this makes it a top destination for surfers and kite surfers. The swell of the waves is much stronger in winter so you’ll see more surfers there at that time of the year. You’ll see plenty of surf shops and surfing schools, as well as windsurfing schools in Essaouira. If you always wanted to learn water sports, wait no longer and book your flight to this beautiful sea-side city now! 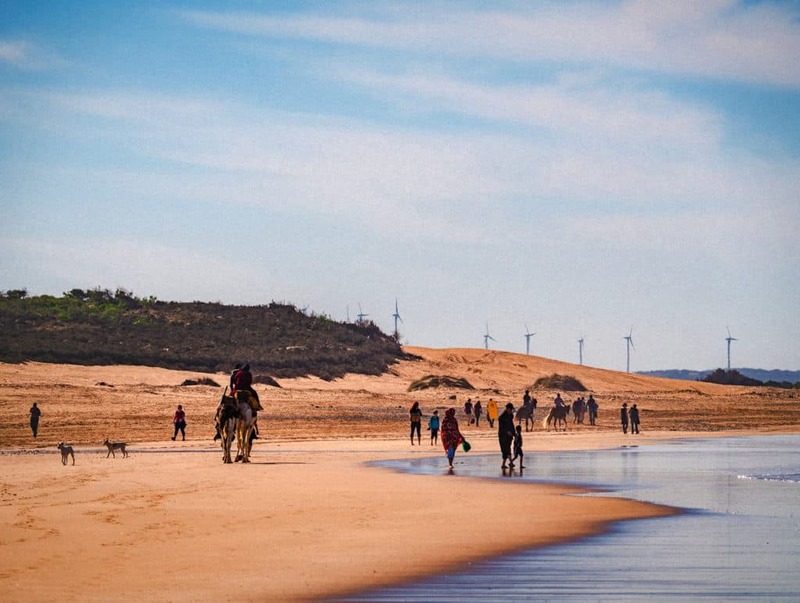 The best spot for surfing in Essaouira is at the far end of the main beach where camels and horses are gathered. You have two options of where to stay in Essaouira. 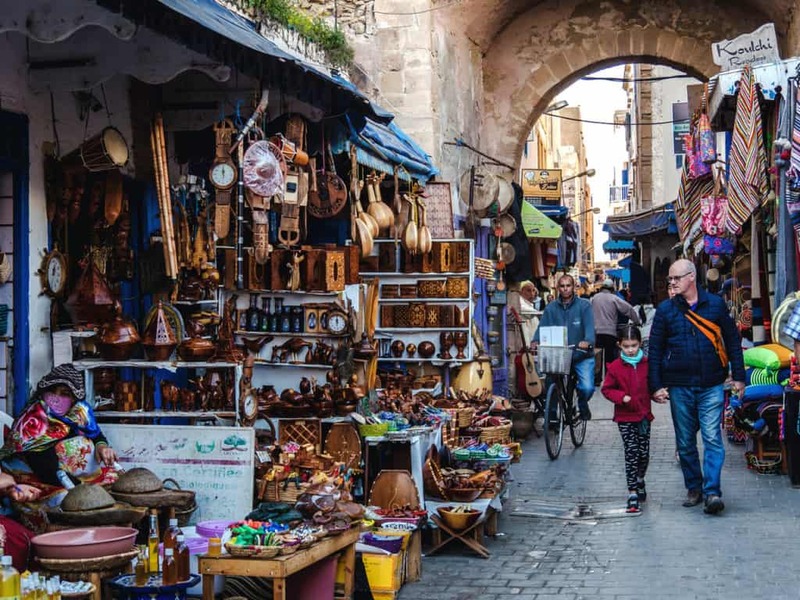 You could either stay inside the old city (close to the beautiful souks and shops filled streets) or outside the fortified walls. 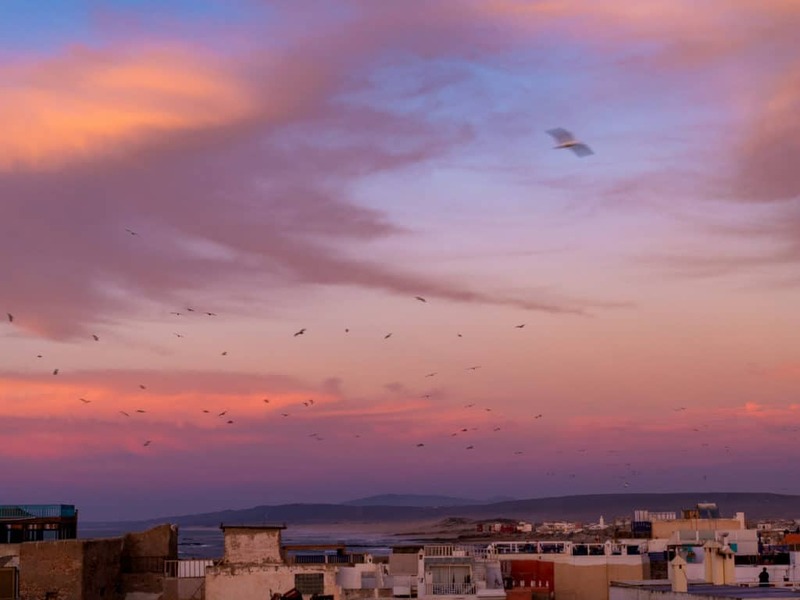 Essaouira is a city that is worth taking the time to discover. It offers many fun activities so you will want to stay there at least a night or two. We even ended up staying there for almost two weeks, we just fell in love with the place! 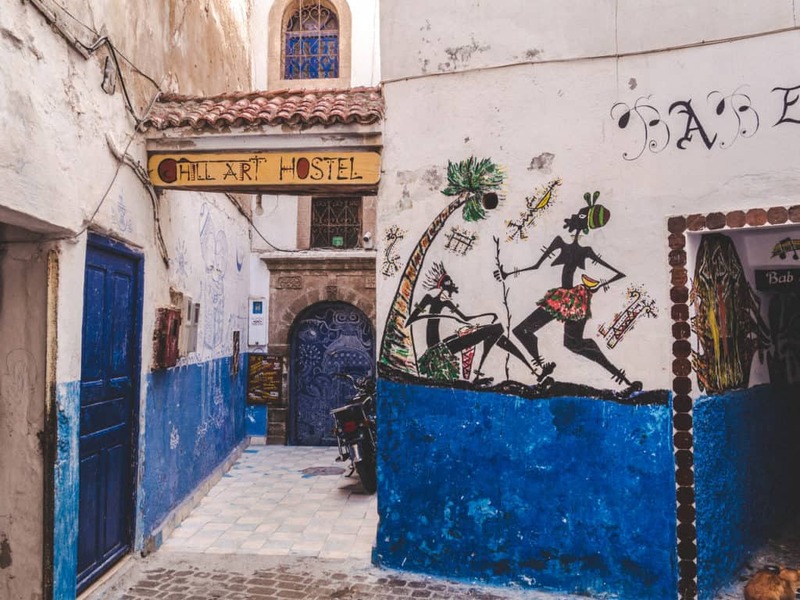 Essaouira has a great selection of hostels for budget travelers who want to save money and swap stories with fellow backpackers in the shared kitchen or bar in the evening. 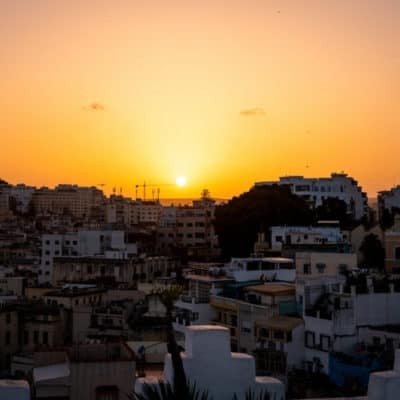 There are also many beautiful Riads, guesthouses, and hotels for the travelers who want a more fancy, relaxing experience of the city. This hostel is one of our top recommendations in Essaouira. We went there a few nights to enjoy live music and share a meal with some of the guests in the main lobby. It was built inside an old traditional restored Ryad and the architecture of the place is fascinating. The Chill Art hostel is also, as its name says, full of art and beautiful murals. There is a delicious breakfast served every morning. It also features a terrace that gives a 180 degrees view of the ocean. This hostel is in a very quiet part of the old city, a bit away from all the hustle and bustle and the shops. A very good continental breakfast can be enjoyed every morning on the beautiful terrace this hostel has. It is located very close to the Supratour bus station so it’s very convenient to stay there if you take this bus company to travel to Essaouira. For those who want a more fancy experience and feel like royalties, this is the place! Hôtel El Kasbah Souiria has a lush garden and has an architecture that reminded us of the traditional Moroccan Riads with its beautiful multicolored tiles. This hotel is just outside the old Medina with one entrance to the old city just one minute away and another one at about a five-minute walk. The beds of this hotel are super comfortable and the surroundings of the building are very quiet. If you want a luxurious yet relaxing stay in Essaouira, don’t think twice and book this place now! Facing the sea, this hotel offers 4-star accommodation and has a private beach area, an outdoor swimming pool, and a garden. It also offers a 24-hour front desk, a shared lounge as well as a very good wifi signal. All the rooms include a desk, a flat-screen Tv as well as a private bathroom, air conditioning, and a wardrobe. 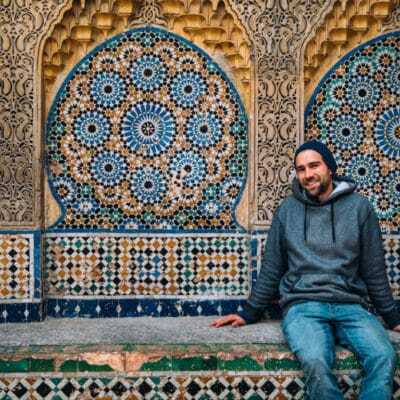 Backpacking in Morocco on a budget – How much does it cost? 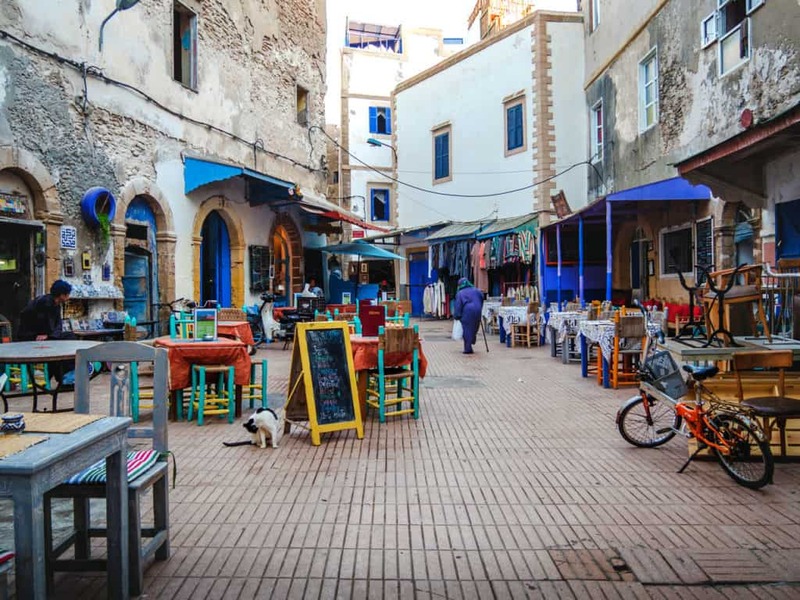 Essaouira has a huge selection of delicious restaurants. 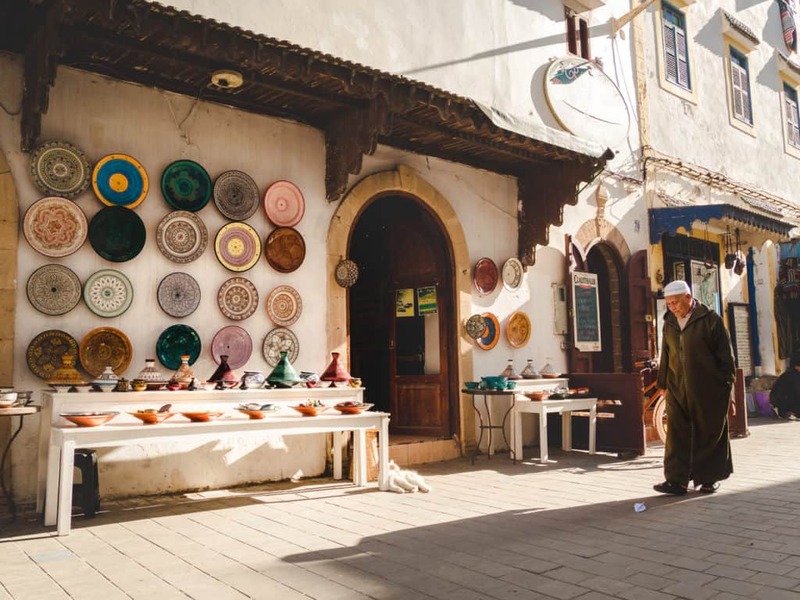 You can eat traditional dishes such as Tajines and harira soup almost anywhere in the city. If you would like something a bit fancier, it’s also possible to enjoy a Mediterranean dinner in one of the few luxurious restaurants overlooking the Moulay Hassan square. If you fancy sandwich places or crepes, those can be found throughout the old city. Making an exhaustive list of all of these restaurants here would be impossible, however, I’ll recommend a few of my absolute favorites. The best thing about this cafe is its location and atmosphere. It’s on the edge of a small quiet courtyard and Cynthia and I just loved the environment there. You can have local fish for dinner such as sardines and it tastes heavenly! They also serve a very tasty breakfast with fresh orange juice, coffee, crepes, yogurt, and delicious jams and honey to put on toasted bread. This restaurant is really not expensive and offers Moroccan dishes as well as some European snacks. The inside of this restaurant is decorated in a very cool and stylish style. It’s the perfect place to enjoy a fancy romantic candlelit dinner without breaking the piggy bank! The menu is small and changes on a seasonal basis depending on which fruits and vegetables will be fresh. They have very good vegetarian and vegan options such as tasty falafel plates. Patisserie Chez Driss is not quite a restaurant, however, it’s where I had the best pastries and sweets ever so I had to include it in this guide. If you love pastries, this is THE place to visit! I just wish I could try everything that was on the shelves. 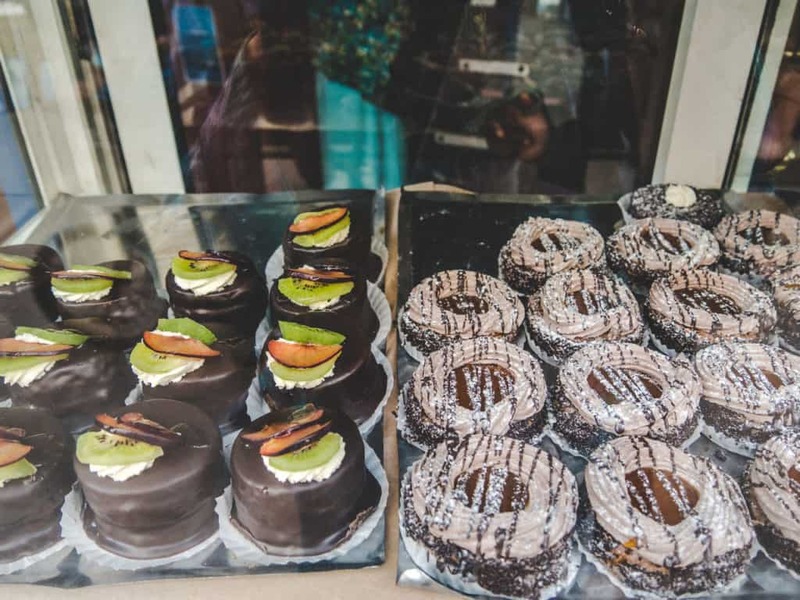 They have a wide selection of cakes, sweet cookies, as well as chocolate eclairs and pastries filled with real cream and almond paste. This is a great place to go grab a drink and enjoy live music on a terrace. 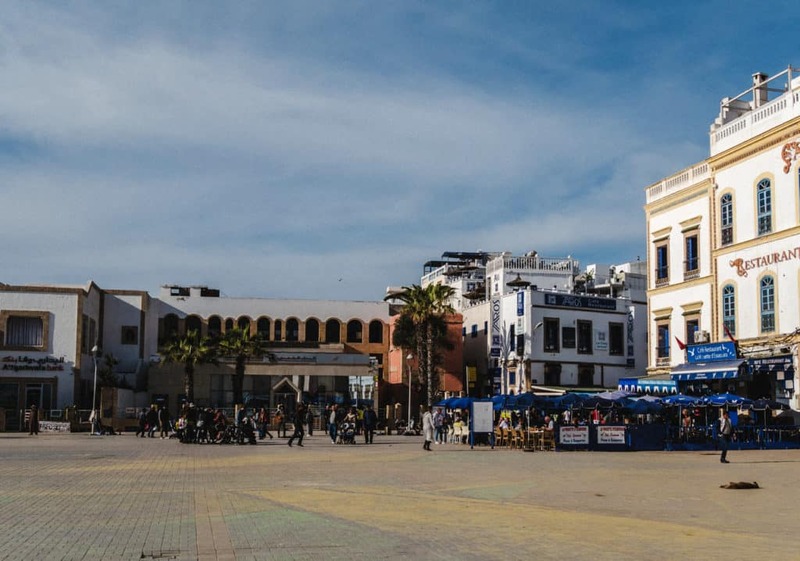 It’s located on one corner of the square Moulay Hassan. 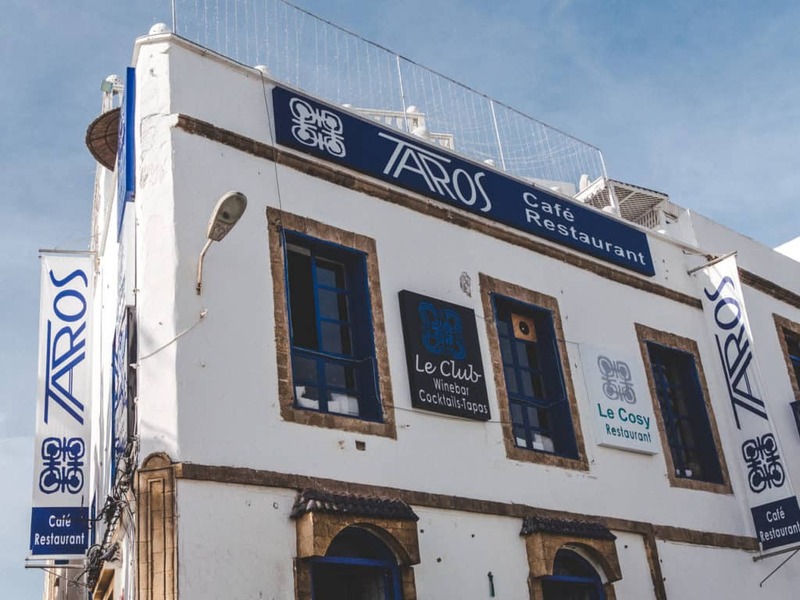 Taros is a mix between a bar, a restaurant, and a club. Its terrace is one of the tallest around the area so it’s the ideal place to enjoy the sunset. The prices are very reasonable and it’s also the perfect place to enjoy a glass of wine while eating a delicious fish and listening to some great music. 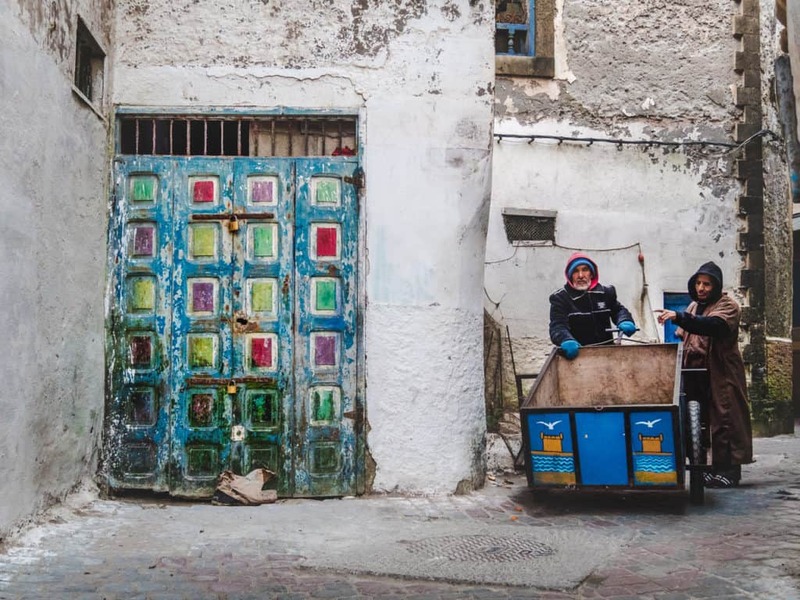 This authentic Moroccan bar also called ”Le Trou” in French is hidden in a small alley. Nothing beats this place when it comes to authenticity. It’s overcrowded every night by local men, travelers, and expats. If you want cheap draft beer, music and wine, this is the place to visit. It’s located behind the Mechouar hotel. If you fancy a glass of wine or some beers at your hostel (first check if your hostel allows alcohol on the premises) after a day of surfing or getting lost in the small streets of Essaouira, you can buy some just outside of Bab Doukala. There is a shop called ‘Libre Service’ selling alcohol just outside of the old city gate. The wine there is usually quite cheap and they have a huge selection of liquors. The shop closes at 8 pm and is also closed on Friday. 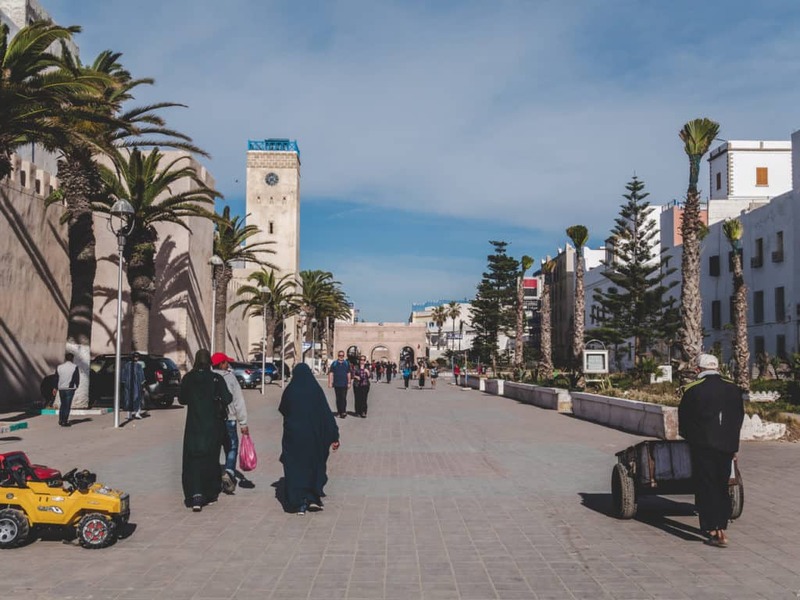 Casablanca is another beautiful coastal city north of Essaouira and since most people will start their trip around Morocco from Casablanca, I decided to include practical information on how to transit between the two cities. The best way to get from Casablanca to Essaouira is by bus with a bus company called CTM. I’ve traveled around Morocco with various bus companies and CTM, although being slightly more expensive, is the only one I would recommend. The buses are always newer and much more comfortable than the ones used by other companies. The trip between the two cities will cost between 215 and 275 MAD and takes around 7 hours. There are 13 buses that leave throughout the day, the earliest being at 7:15 and the latest at midnight. You can catch the bus at the CTM bus station in Casablanca in the city center on Rue Léon (see map down below). You can buy your ticket in advance at the bus station or book it online. 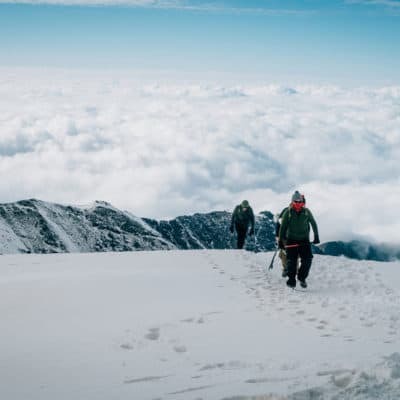 Remember, if you book your ticket online, you still have to go to the CTM office to pay for your luggage on the day of departure so make sure you arrive a bit ahead of time. In Essaouira, you’ll reach the main city bus station “Gare Routiere” located just 10 minutes on foot outside of the city gate Bab Doukala (see map below). From there you will be practically in the old Medina and right in the city center. This bus station has toilets and it’s located next to small cafes and shops. Since these two cities are located on the coast, a great idea could be to travel from one to the other by car. Whether you travel with your own car or in a rented one, this road goes along some gorgeous landscapes and you’ll have the freedom to stop whenever you want to take pictures. 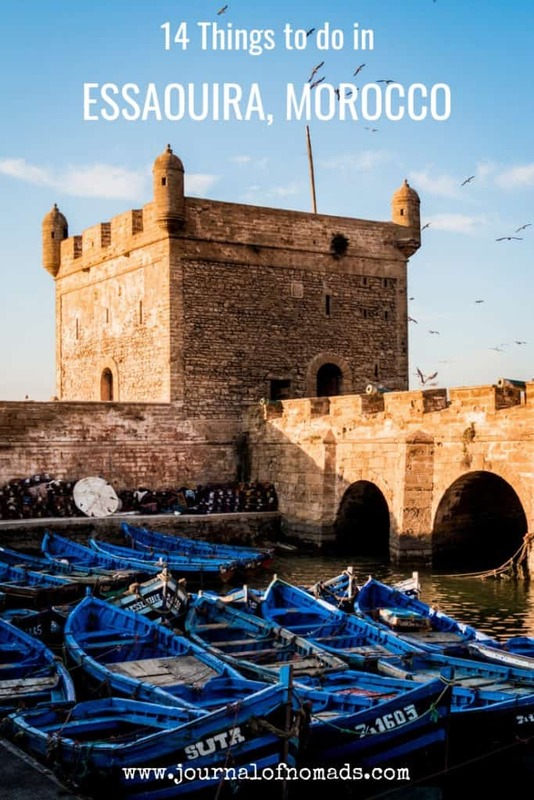 This drive is definitely a pleasant one and along the way, you’ll pass through another gorgeous little coastal city called El Jadida (see below ‘Other places to visit near Essaouira’). The driving distance between Casablanca and Essaouira is 371 km. It should take around 4 hours to reach the southern city. To drive from Casablanca to Essaouira follow highway A1 towards the south along the coast until you reach a roundabout to the city of Bouguedra. Take the direction of Bouguedra and from this city continue driving south-west on highway N1 until you reach Essaouira. 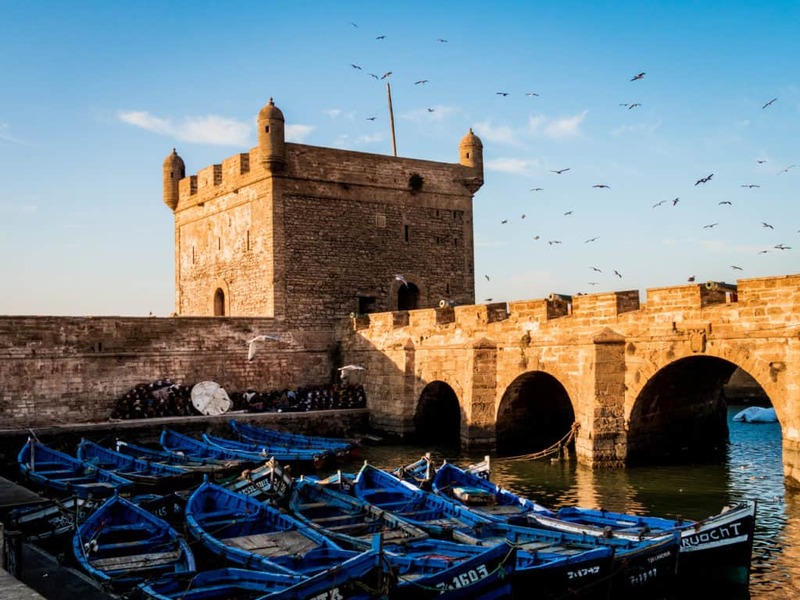 Another good option to get to Essaouira from Casablanca is to take a combination of a train and a bus and pass through the city of Marrakesh. 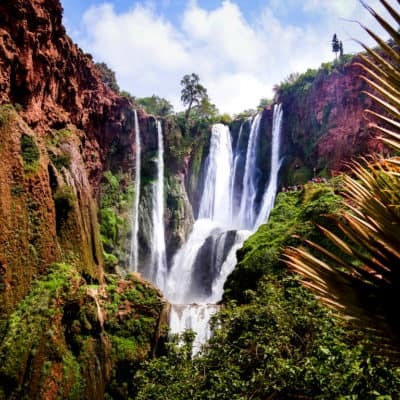 Traveling around Morocco by train is a fantastic idea because they’re cheap and they are an awesome way to see the incredible Moroccan landscapes. In Morocco, it’s very easy and quite convenient to buy your train tickets in person directly at the train station. All the information concerning timetables and prices can be found on the ONCF website, once you know which train you will take and at what time you can head over to the Casablanca train station to buy your ticket. Make sure to have cash on hand to buy your ticket as it’s not always possible to pay by card. There is a direct train leaving daily from Casablanca (see map below) and arriving in Marrakesh. The train leaves nine times a day and the journey takes approximately 3h. 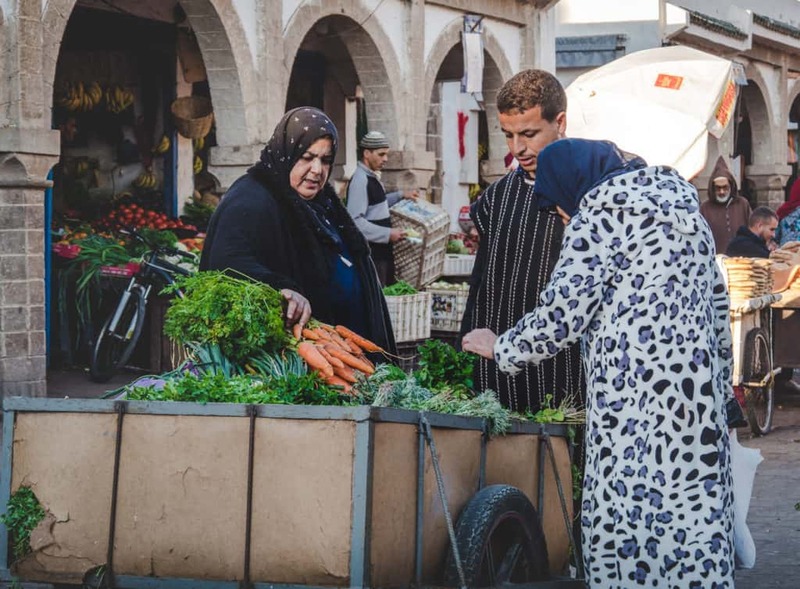 Once you are in Marrakesh, you’ll need to walk for about 15 minutes to catch a bus from the main station in the direction of Essaouira. A combination train/bus ticket is available for purchase for this route at the ONCF website. Getting a bus out of Marrakesh is relatively easy. 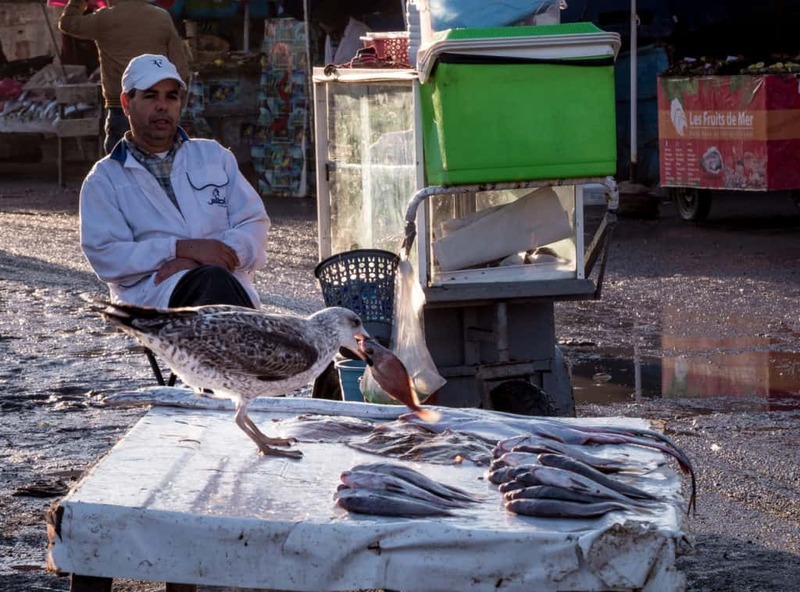 You can find a Supratour or a CTM bus to Essaouira at the main Marrakesh bus station. This bus station is located almost adjacent to the train station in Marrakesh. The ticket prices for these 2 bus companies are almost the same and the CTM timetables and ticket prices can be found here. The journey with bus from Marrakesh to Essaouira takes 3 hours with a twenty-minute break somewhere along the way. If you have your own car, the fastest way to get to Essaouira from Marrakesh is by following the highways A7, N8 and R207. From Marrakesh, you will have to drive north-west on the A7 until it merges with highway N8 and R207. Follow the highway R207 west until you reach Essaouira. 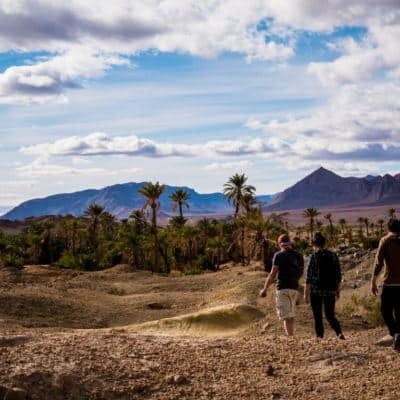 The distance between Marrakesh and Essaouira is 191 km and getting there will take about 2h40 minutes. The best way to get from Marrakesh to Essaouira if you don’t have your own car is by shared Taxi. The price per person in a shared taxi should be between 85 and 220 MAD. You can take a bus from Agadir to Essaouira with CTM, Supratour or any of the other bus companies that operate from Agadir. It’s possible to buy the ticket online or at the bus terminal. 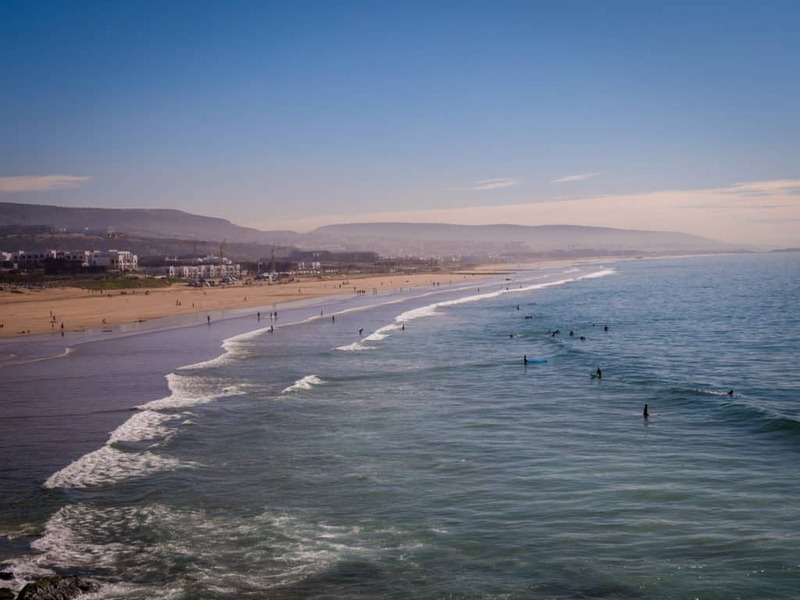 Agadir’s Gare Routiere is just 2.5km from the city center and the beach. A taxi from the beach to the bus station will cost about 10 to 15 MAD. This bus station is quite easy to navigate through and platforms with numbers and bus company names are clearly marked. The coastal road between Agadir and Essaouira is enchanting and driving there will give you a feeling of total freedom. If you have your own car or if you are renting one, just follow highway N1 towards the north. The distance between the two cities is 175 km and the trip should take about 3 hours. 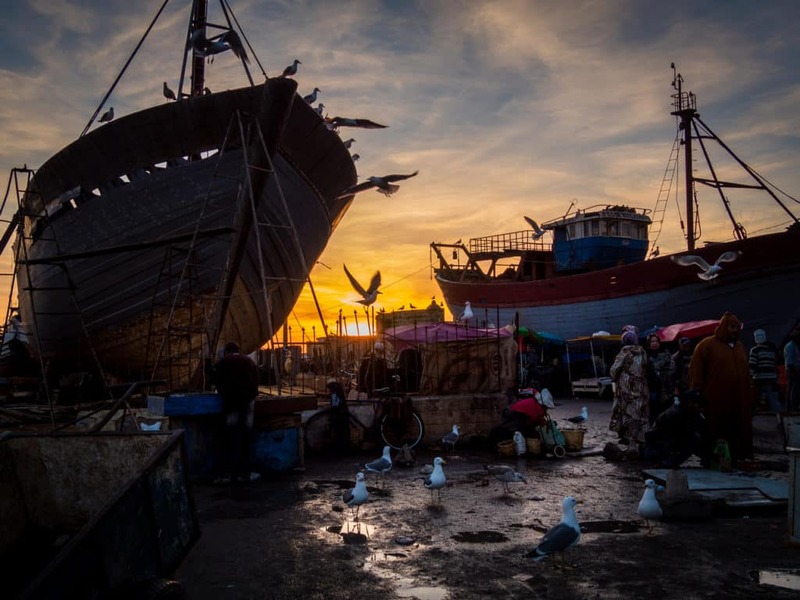 You will find shared taxis that can take you to Essaouira from the main bus terminal. A shared taxi will take about three hours to cover the distance between the two cities and will cost between 90 and 200 MAD. There are two bus terminals in Essaouira, one is used only by CTM and the other one is used by Supratour and the various other bus companies that operate there. The Supratour terminal is much closer to the old city while the CTM one is located a bit farther. The Supratours bus stop can be found just southwest of the square known as Bab Marrakesh. Essaouira is not very big so you can easily explore the old medina on foot. If you need to be in the new part of Essaouira (to go to the bus station f.eg. ), all the taxis in the city have the same flat rate – 7 MAD. So there is no need to negotiate when you hop in the taxi, just tell the driver where you want to go and pay when you arrive. 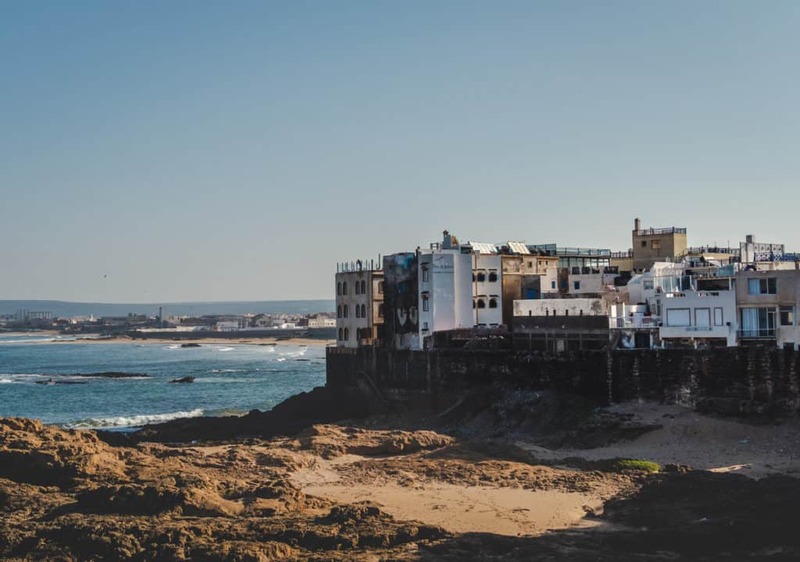 There are two other coastal towns north and south of Essaouira that we would recommend visiting while you’re on the Moroccan coast. 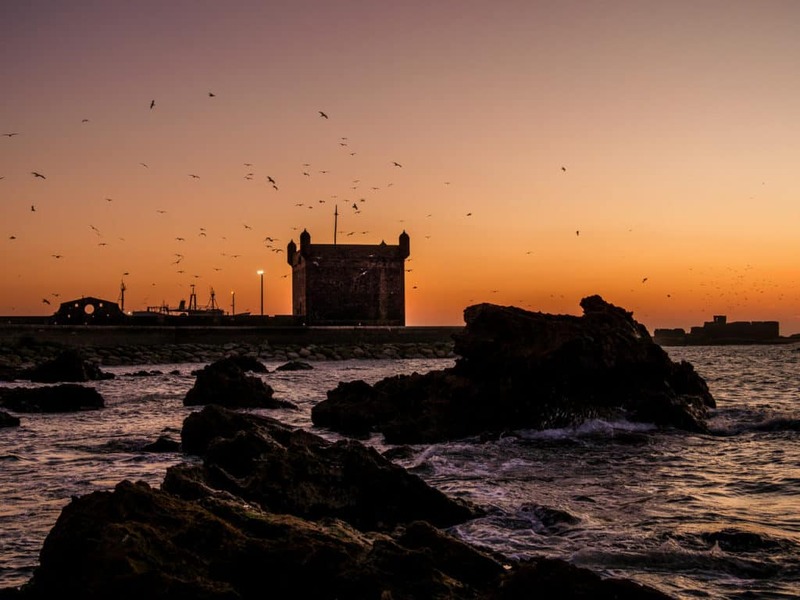 These are the cities of Taghazout and El Jadida. 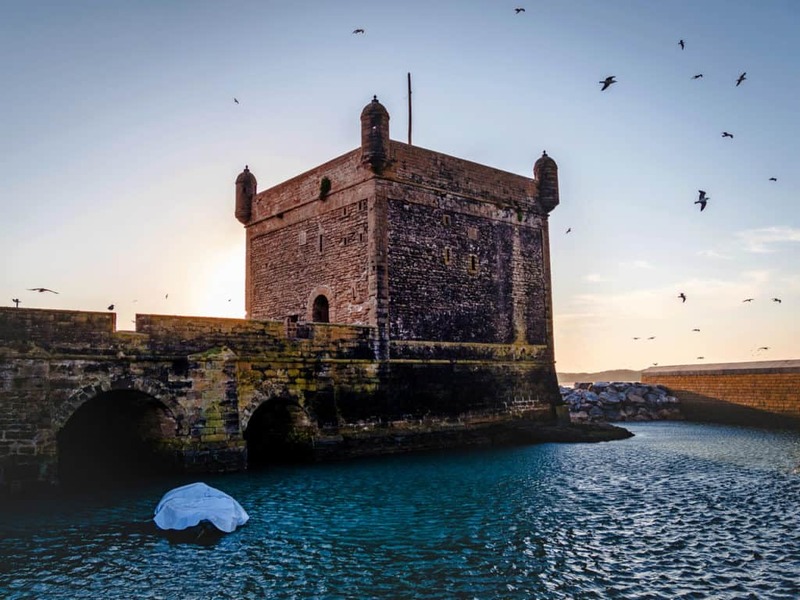 They are both quite different and their proximity to Essaouira makes them ideal locations to visit after your stay there. 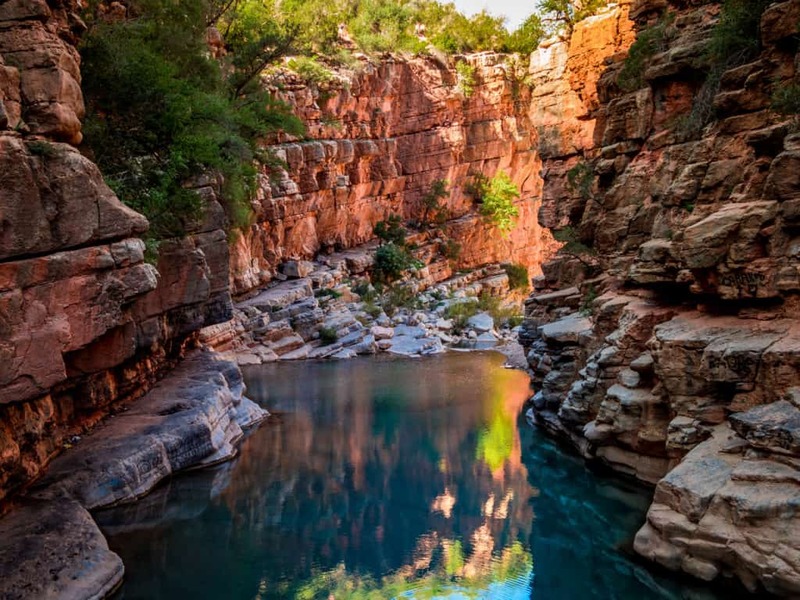 I would also strongly advise you visit a beautiful canyon filled with pools of water east of Taghazout called Paradise Valley. 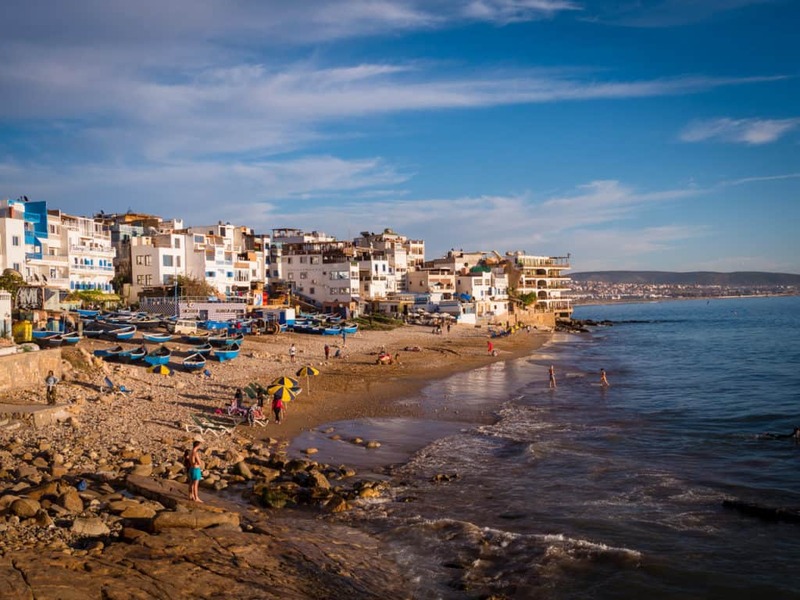 Taghazout is a cool surfing town where surfers from all over the world come to enjoy the winter waves. 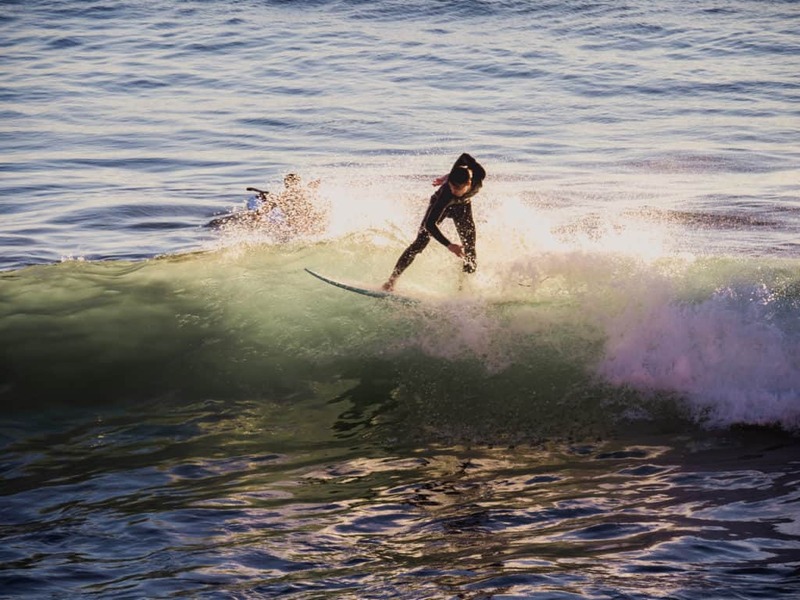 It’s sometimes quoted as one of the best winter surfing destinations in Morocco. The water temperature rarely drops below 16C in winter and the air temperature hovers around 18-20 C even in January. This town has an amazing vibe as you can imagine any surfer paradise would have. 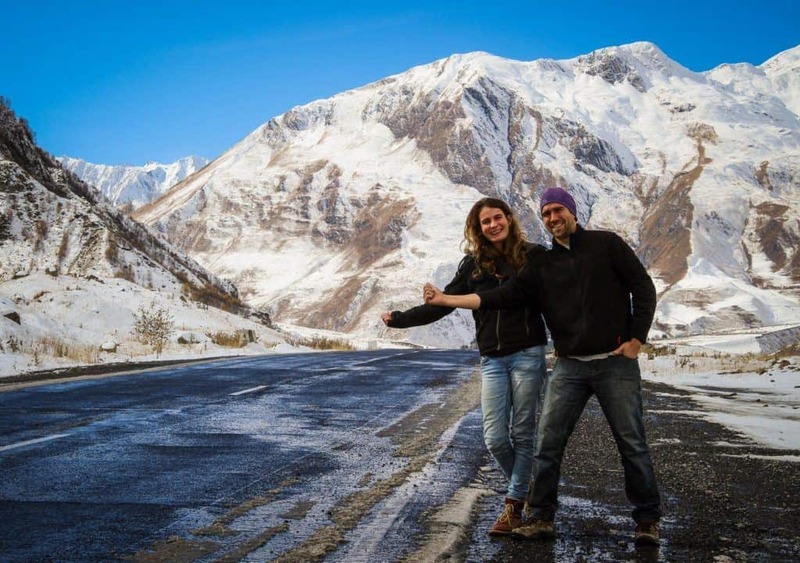 There are plenty of cheap hostels there where you can meet fun travelers in pursuit of waves. How to get to Taghazout from Essaouira? 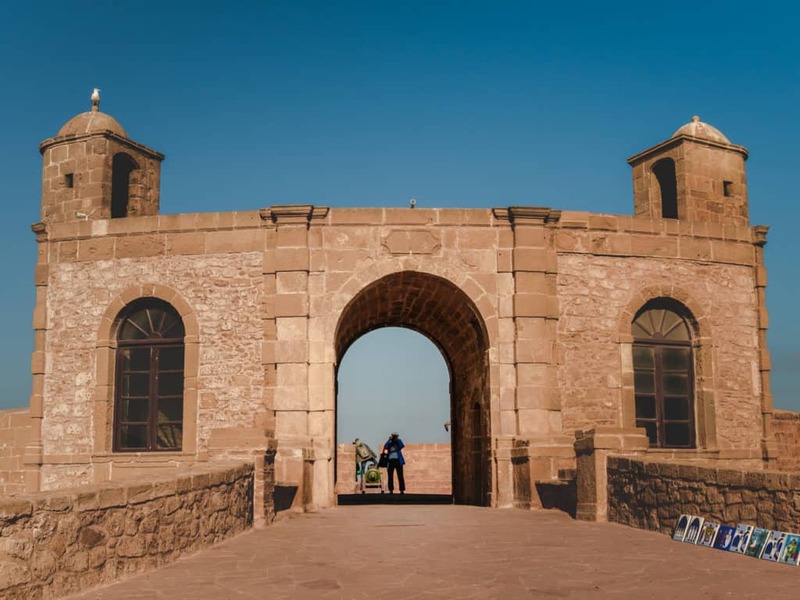 From Essaouira, you can take a bus in the direction of Agadir (either with Supratours or CTM) The journey between Essaouira and Agadir costs about 65 MAD but you will have to arrange with your driver to drop you off in Taghazout 20 minutes north of Agadir. You should do this upon purchasing your ticket just to be sure you will be dropped off at the right place. If you have your own car or if you’re renting one, you can follow highway N1 south until you reach the surfing hub. The distance between the two coastal towns is 154 km and the trip should take about two hours and a half. There are plenty of viewpoints along the way where you can stop to get great pictures of the coastline. Paradise Valley is a limestone canyon filled with palm trees and pools of pristine turquoise water. It’s located in the mountains 40 minutes east of Taghazoute. 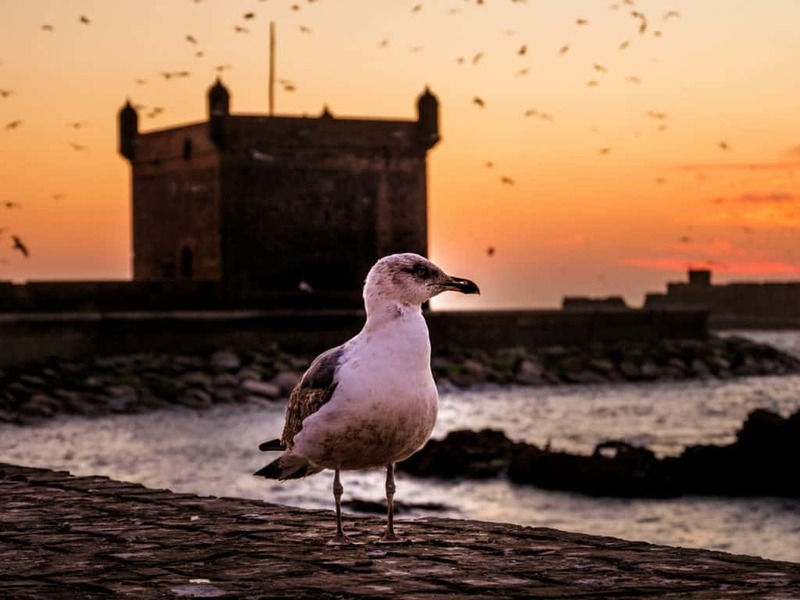 To get there from Essaouira, you’ll first have to get to Taghazoute. You can get there by bus or with your own car (see above). 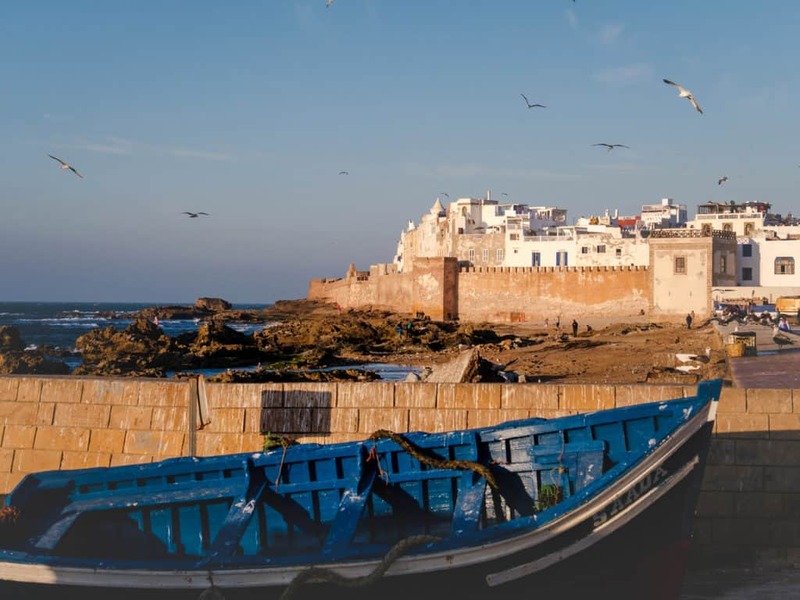 This small city north of Essaouira is quite famous for its appearance. 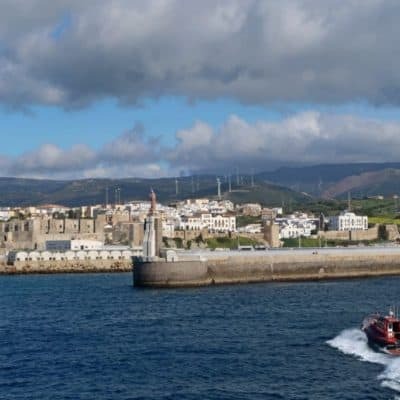 It has massive Portuguese fortifications and a very interesting architecture that is unlike any other Moroccan city. Although it’s not a huge holiday destination, it is quite popular among the Moroccans who go there to enjoy small resorts facing the sea. 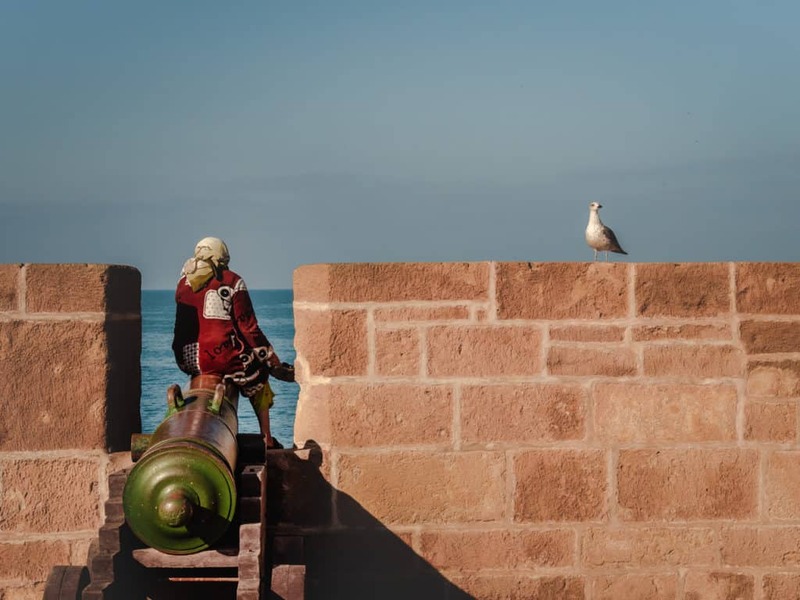 How to get to El Jadida from Essaouira? There is a daily CTM bus that leaves from the CTM terminal in Essaouira to El Jadida. It takes about 4,5 hours to reach the northern city and a ticket costs 110 MAD. If you have your car and want to drive there, simply follow the highway N1 towards the north. The distance between the cities is 255 km and the trip should take 3h45. One small note I would like to add at the end of this guide is how useful an Arabic phrasebook has been for me to get by around Morocco. I highly recommend getting your hands on the Lonely Planet Moroccan Arabic Phrasebook. 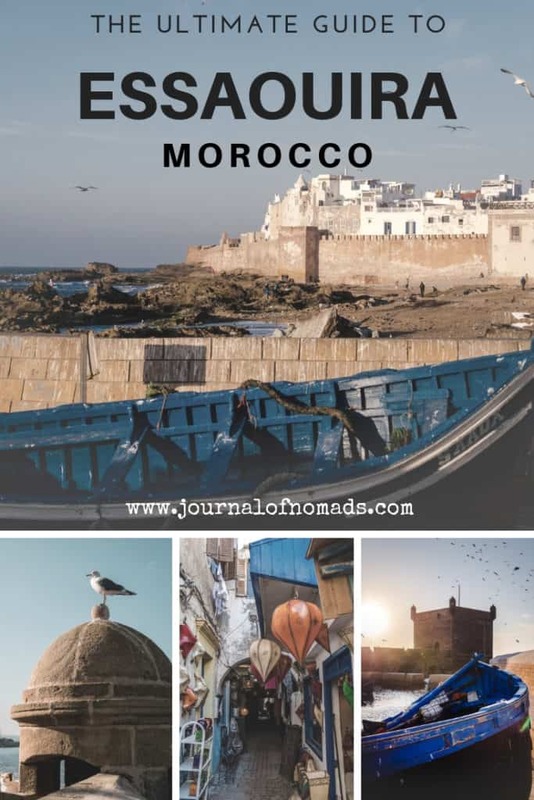 It is packed with all the essential words and phrases you will need on your trip to Morocco and will help you in every situation — from finding a hotel room to ordering tajine or joining the local festivities, this book will cover almost every situation you could imagine. 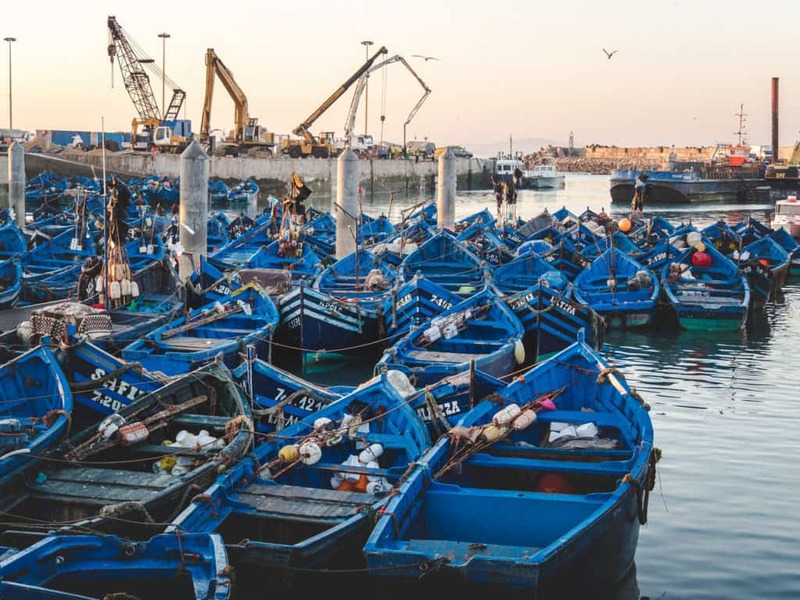 I hope this guide to Essaouira will help you and make your stay in this fishing town more enjoyable. Have you been to Essaouira already? What did you like the most about this town? Are you planning on going soon and do you have more questions? Let us know in the comments below. **This article contains some affiliate links. If you book a hotel/hostel or purchase one of the recommended products through our website, we’ll receive a small commission at no extra costs for you. This way you’re helping us writing more informative and awesome guides like this. Thank you! This was good to read. 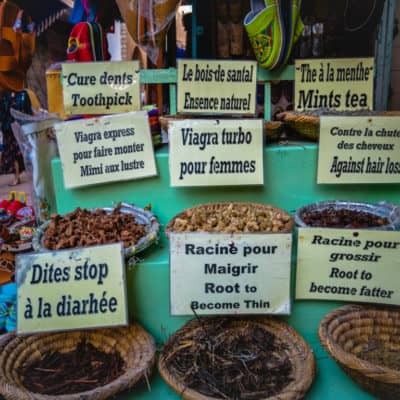 Too bad I haven’t found on my travel to Morocco, but at least I can use these tips when I go back! Hi Niko, I just miss the chance of seeing this place like you did. So, hoping to have a good experience in my second visit. You will love Essaouira Agness! 🙂 It really is a lovely city! Thank you very much for helpful and for exciting me to elect them for the Morocco excursion! 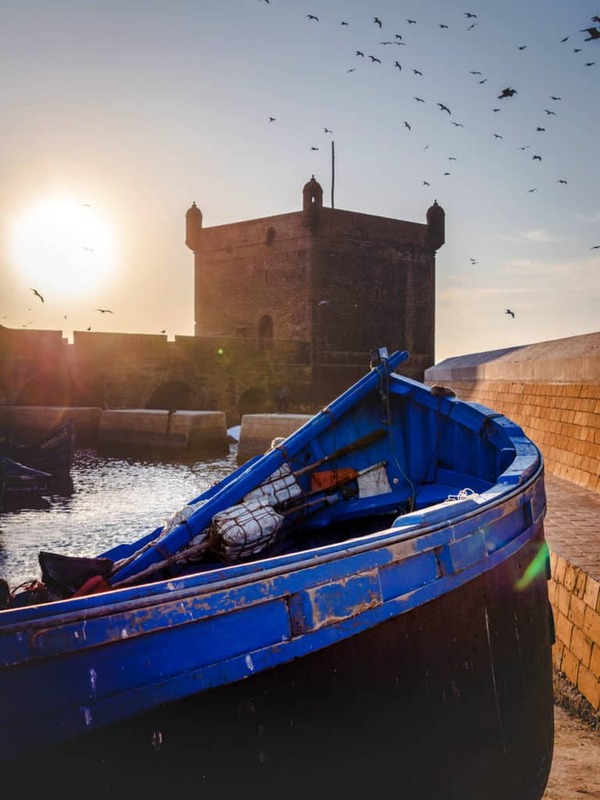 You will love Essaouira Agness 😀 We’re glad we could help you prepare your trip to Morocco.